Since buying Sandhurst Manufacturing Ltd (SMC) and its plant at Gosberton, Lincolnshire in 2010, the brand has evolved to become a market leader, thanks to the consistent investment in innovation and design and a sharp focus on changing market trends and requirements. From producing just one lighting tower model at the time of acquisition – the SMC TL90 metal halide – the business today delivers over 25 variations of its robust lighting towers. 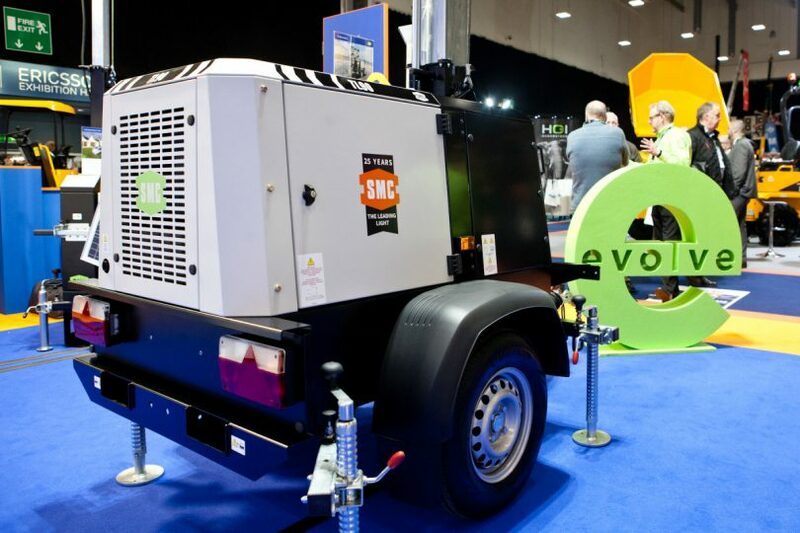 They light the way in the UK and overseas to serve the rental, construction, road and rail, oil and gas, events, TV and film sectors and sit alongside the company’s other world-class site machinery brands – Denyo, ArcGen and Hilta. So, what is the secret of building a brand which can evolve so consistently and spectacularly and which today forms over 60% of sales for the business, part of a fifth-generation family-run group celebrating its 150th anniversary this year. Step forward three of the industry’s leading lighting tower gurus: Paul Kelham, SMC Operations Director, Robin Brand, Chief Design Engineer and Roger Burland, Development Engineer. This trio who have worked seamlessly together for over 25 years, designed the very first lighting tower for the company, the TL35. Since then they have remained at the heart of the business representing over 75 years’ industry experience between them and a passion for their work. As pioneers, SMC were the first to market with the UK’s first and only British built Solar lighting tower – just ahead of the environmental awareness curve. Today’s model, the TL55 Solar, is sustainable, economical and environmentally friendly, offering an impressive 500 hours uninterrupted run time from the battery and indefinite lighting when including solar power. New product development at Morris Site Machinery has soared in recent years through constant investment by the Morris brand itself. Allan continued: “We now have our most comprehensive lighting tower line up of all time – from ultimate, standard to value to suit all budgets and requirements. Our innovations have embraced environmental and sustainability concerns with cost-effective products, utilising new and fast-moving technologies. In addition to having the best skills on the market, the business also considers customer relations pivotal in the development of new SMC models to suit specific industry sectors and applications. “There is little doubt that the most important factors about the SMC range for the Australian market, are about longevity, reliability and quality. Over the years, we have developed strong ties with key hirers here and together developed lighting models such as the SMC TL90 Extra Low Voltage tower to suit the exact criteria and stringent health and safety legislation there. In fact, when Morris Site Machinery acquired the brand, sales into Australia went from over 25 units a year to over 200 and an imminent announcement is expected to take its sales to its highest level yet. It is business in the UK however that remains the bedrock of the business and building relationships and models in conjunction with customers, sits at the forefront of 2019 planning. Gary Derraven, chairman of Phoenix Hire and Sales, has worked in the hire industry for 39 years and has a fleet of 24 SMC TL90 lighting towers. The company is based in Cwmbran with depots at Bridgend, Cardiff and Pontypridd. He said: “I like the quality of the product and the service I get from Morris Site Machinery, they are a friendly company to deal with. The business has fan-fared the arrival of 2019 with a brand new product: SMC TL90 Evolve. This has the functionality of the market leading SMC TL90 but with a new ergonomic design, more compact appearance and three lamp head options. The SMC TL90 Evolve+ has six powerful lamp heads making it the country’s brightest LED lighting tower. Another first for the brand and business.